Hydrodynamics of Chwaka Bay, a shallow mangrove-fringed tropical embayment, Tanzania (N. Nyandwi, O.U. Mwaipopo). Tidal characteristics of an accretional tidal flat (The Wash, U.K.) (X. Ke., M. Collins). Quantifying concentration and flux of suspended particulate matter through a tidal inlet of the East Frisian Wadden Sea by acoustic doppler current profiling (P. Santamarina Cuneo, B.W. Flemming). Surface erosion of fine-grained sediment revisited (A. J. Mehta, T.M. Parchure). Comparison of the erosion shear stress of oxic and anoxic sediments in the East Frisian Wadden Sea (I. Austen, G. Witte). Mass balancing the seasonal turnover of mud and sand in the vicinity of an intertidal mussel bank in the Wadden Sea (southern North Sea) (A. Bartholomä, B.W. Flemming, M.T. Delafontaine). Mass balancing the seasonal turnover of POC in mud and sand on a back-barrier tidal flat (southern North Sea) (M.T. Delafontaine, B.W. Flemming, A. Bartholomä). Significance of microphytobenthic primary production in the Bodden (southern Baltic Sea) (S. Gerbersdorf, H.J. Black, J. Meyercordt, L.-A. Meyer-Reil, T. Rieling, I. Stodian). Bodden waters (southern Baltic Sea) as a source of methane and nitrous oxide (S. Dahlke, C. Wolff, L.-A. Meyer-Reil, H.W. Bange, R. Ramesh, S. Rapsomanikis, M.O. Andreae). Geochemical investigations of iron and manganese in coastal sediments of the southern Baltic Sea (I. Stodian, H.J. Black, S. Gerbersdorf, M. Köster, L.-A. Meyer-Reil, T. Rieling). Phosphorus in sediments from coastal waters of Mecklenburg-Vorpommern (southern Baltic Sea) (S. Berghoff, G. Schlungbaum, U. Selig). Benthic microbial decomposition of organic matter and nutrient fluxes at the sediment-water interface in a shallow coastal inlet of the southern Baltic Sea (Nordrügensche Bodden) (T. Rieling, S. Gerbersdorf, I. Stodian, H.J. Black, S. Dahlke, M. Köster, J. Meyercordt, L.-A. Meyer-Reil). Significance of aerobic and anaerobic mineralization processes of organic carbon in sediments of a shallow coastal inlet in the southern Baltic Sea (M. Köster, H.-D. Babenzien, H.J. Black, S. Dahlke, S. Gerbersdorf, J. Meyercordt, L.-A. Meyer-Reil, T. Rieling, I. Stodian, A. Voigt). Effects of plant roots on salt-marsh sediment geochemistry (M.I. Caçador, M.J. Madureira, C. Vale). Elemental composition of siderite grains in early Holocene deposits of Youngjong Island (west coast of Korea), and its palaeoenvironmental implications (B.-K. Khim, K.-S. Choi, Y.A. Park). The impacts of sea-level rise on the coastal fisheries resources and aquatic ecosystems of Cameroon (Central Africa) (C.E. Gabche, T.J. Youmbi, C.A. Angwe). Impacts of sea-level rise and human activities on the evolution of the Pearl River delta, South China (M.-K. Han, L. Wu, Y.-F. Liu, N. Mimura). The combined impacts of mean sea-level rise and secular trends in mean tidal range on the marine environment in the vicinity of the Huanghe River mouth (J. Zhang, J. Wang). The missing mud flats of the Wadden Sea: a reconstruction of sediments and accommodation space lost in the wake of land reclamation (S. Mai, A. Bartholomä). The Wadden Sea squeeze as a cause of decreasing sedimentary organic loading (M.T.Delafontaine, B.W. Flemming, S. Mai). The utilization of coastal tidal flats: a case-study on Integrated Coastal Area Management from China (Y. Wang, X. Zou, D. Zhu). Muddy coasts are land-sea transitional environments commonly found along low-energy shorelines which either receive large annual supplies of muddy sediments, or where unconsolidated muddy deposits are being eroded by wave action. 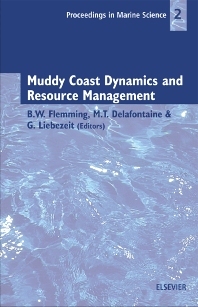 In providing 21 case studies in different parts of the world this book provides an up-to-date review of the state of the art in muddy coast research. Issues dealing with hydrodynamics and suspended matter transport, erosion, deposition, and sediment budgets on tidal flats, primary production, nutrient fluxes and mineralization in lagoons are treated in a multi disciplinary manner. Most articles deal with issues which are of relevance with respect to global warming and future sea level rise. @from:D. Scavia, Nat'l Oceanic and Atmospheric Administration, USA @qu:...The papers were all peer reviewed prior to publication and their quality reflects that. The results of thorough editing and proof reading are clearly evident. The common format among papers and clear writing style made for easy reading and comprehension.